The device does not automatically power on when plugged in so if the device runs out of battery it would need to be manually powered back on. The device comes in a water resistant silicone cover. Do not remove cover! This will void warranty. The screen will be blacked out to prevent your child from playing with it. NOTE: When troubleshooting, if you can see the the battery charging icon with the percentage showing on the device's whole screen when it is plugged in, this means that the device is OFF. 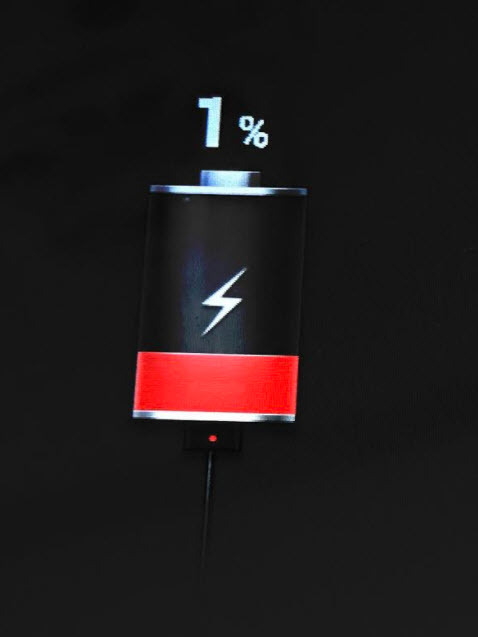 This is the factory warranty default to show the battery percentage on the entire screen, as shown in the picture below, when the device is powered off. The device does charge while it is off and connected to the charger, so it would simply need to be powered on. Why is my device's screen blacked out? How do I adjust the volume on my audible indication of charging?